Aalto University is a Finnish university established on January 1, 2010 in the merger of the Helsinki University of Technology, the Helsinki School of Economics, and the University of Art and Design Helsinki. Piresma, Inforcon, OIP, et. al. Note: Surviving website(s) retrieved and archived in February, 2008. The Helsinki School of Economics and Business Administration is the third oldest institute of higher education in Finland. The School was established by the business community in 1904, becoming an institute of university standing in 1911. It remained privately operated until 1974, when financial responsibility was turned over to the State of Finland. The School is, however, autonomous in the administration of its internal affairs. Today the HSEBA is the leading business school in Finland with extensive international relations. During its over eighty years of existence, over 15,000 students have graduated from the School with a Bachelor of Science, Master of Science or PhD in Economics. 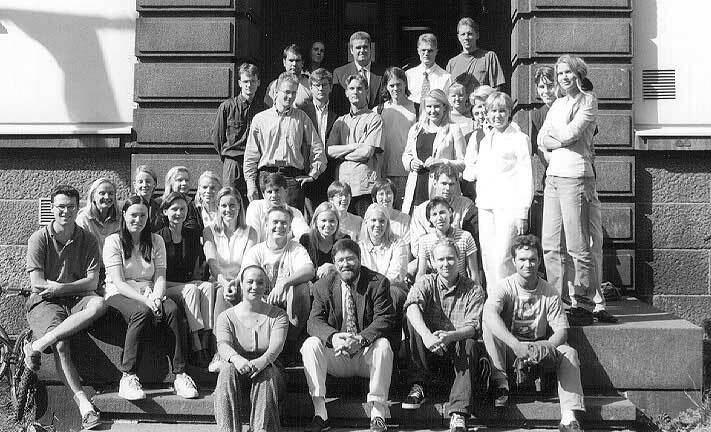 In 1995, the Helsinki School of Economics and Business Administration launched the Interactive Telecommunications Program which is a summer program providing business students with basic multimedia and telecommunications skills. The program is carried out in English and offers a complete minor subject in MSc. Program for a restricted number of students. The objective of the Interactive Telecommunications Program is to provide students with an understanding of interactive telecommunications technologies and business, and the production and design of multimedia applications and products. The program provides the necessary tools, concepts, and approaches that enable students with diverse backrounds to integrate into the world of telecommunications and digital media. Students are able to combine general telecommunications and multimedia training with their previously studied specialities, and thus allowing them to work better in the challenging and complex international business environment. The program is directed at senior level undergraduate students, MSc. students, BBA, MBA and doctoral students interested in working with digital media and interactive telecommunications. The program consists of two tracks, which are run in parallel. Thus, students can apply either to the Telecommunications Track or to the Multimedia Track. Each track is worth 16 MSc. credits and has qualified in previous years as a minor subject in the MSc. program at HSEBA. The Telecommunications Track aims at providing students with an understanding of technological, economic, and business aspects of the converging telecommunications and information industries. The courses require no previous experience or studies in the field, although it is helpful. However, it is essential that students understand spoken and written English with ease and can express their thoughts clearly in English. The courses offered are in intensive modules. A normal one-semester university course is shortened to three weeks of full time study. Each course normally includes 45 contact hours (3 hours a day, five days a week) excluding group work and individual assignments. Class attendance is compulsory. The courses include class projects for telecommunications and multimedia companies. All students are required to be available for the company projects. For HSEBA degree students there is no tuition fee, but they may have to purchase books and other study materials for some courses. Students from other universities (in the Helsinki area) can also apply, and if selected, participate according to the rules of JOO-argeement. Foreign students should contact the ITP staff for more information. "The program was good as a whole and really was worth the effort. It gave me a sound overview of the telecommunications field. It could also be described as a short syllabus to the science of engineering. In my work, I have found the information learned in the program useful." "ITP provided me with a headstart in my telecommunications career. The program's lecturers explained high-tech concepts to business students in a clear and understandable way." "The program made me want to take advantage of IT in traditional business. The project work carried out for Ericsson taught me teamwork, and brought the program closer to practice. Now I feel I have the basic knowledge and the will to work in telecommunications related businesses; actually I have already received several job offers." "I appreciate the value-added aspects the program was able to bring in to marketing high-tech products. The students were active and well prepared for disucussion. I noticed good potential for future recruiting as well."